The west, after the Civil War here in the US, is pretty much the foundation and bedrock of what the identity of the US became. Real people lived out their lives, while larger-than-life stories were being told of them. But how much was fabrication and how much was actual? Well, in Western Legends, you get to decide, as you take on the role of a Western hero and must make a name for yourself among the cattle drives, gold prospectors, and dusty streets. The game is up on Kickstarter now. Red Falls. Darkrock. Two towns on opposite ends of the mesa. Two towns in the middle of God's own nowhere. You step off of the train and feel yer boots hit the red dirt as you pound the dust from yer coat. You only have iron on yer hip and a few bucks to yer name. But that doesn't mean folks should go underestimatin' ya. The only question to answer now is how will you make them remember yer name? 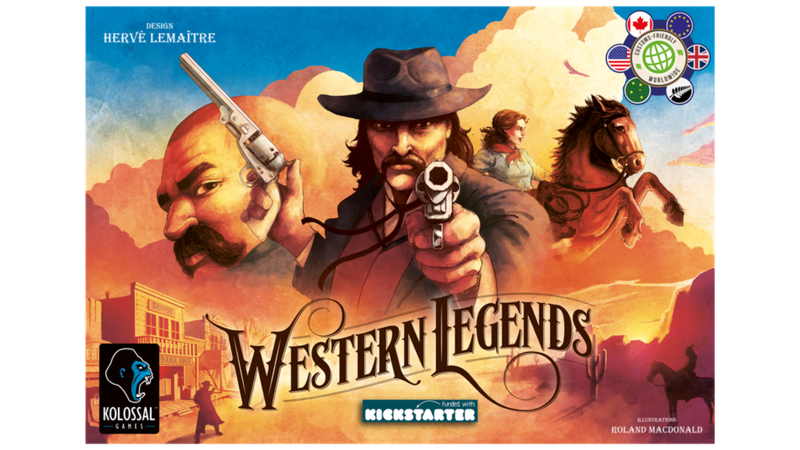 Western Legends is an open-world sandbox tabletop adventure for 2-6 players set in the American Wild West designed by talented newcomer Hervé Lemaître. Players assume the roles of historical figures of the era, earning their legendary status in a variety of ways. Gamble, drive cattle, prospect for gold, rob the bank, fight bandits, pursue stories, become an outlaw, keep the peace... the possibilities are darn near endless. How will you build your legend? The campaign's closing in on 3x funded (if it's not there already by the time you read this), with still 17 days left to go.